I hope you all had a delicious weekend! We celebrated Easter and our weekend was full of amazing eats... from a great brunch out after Easter service and a wonderful ham dinner with The Baron's family. We had fun decorating eggs this past Saturday and with nearly 2 dozen hard boiled eggs left, recipes using them up are welcomed this time of year. 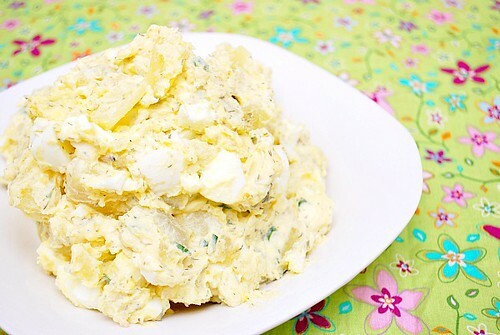 An easy way to use up those eggs is to make egg salad. This recipe incorporates both egg and potato into a springtime salad that can be eaten as is or if you don't mind a slight carb overload, it can be used as a sandwich filling. Either way, it's a great dish and one I prefer eating as is. Joel loves it too! Looks great!!! Love the addition of dill! I've heard of using pickle juice in potato salad. I like the addition of dill better!